Currently 1.8 million die from diarrheal diseases annually. Safe water can reduce the burden of the disease. Household Water Treatment and Safe Storage (HWTS), is an intermediate option, particularly for individuals living on 1-3 dollars a day. Therefore, the creation of local and affordable HWTS products is key for many countries, especially in rural areas. In these zones its cheaper to have HWTS than piped water. In order to insure this, a sustainable supply chain production and production line are necessary. Antenna has collaborated with the Swiss Development Agency (SDC) to support 7 business models which deliver safe water to the base of the economic pyramid. The objective is also to consolidate viable business model in order to replicate them in other countries. This is a three year initiative (2015-2018) aiming to increase access to safe water particularly for people living at the base of the economic pyramid (BOP), with a human right to water framework. AFFORDABLILTY – Less than 3% of an individual of the BOP’s income. Giving away or subsidizing House Hold Water treatments (HWTS) such as chlorine or filters has not only distorted the market; it has also created an expectation that HWTS are goods which it is better to wait for than to buy. As a result, Antenna does not distribute its HWTS solution free of charge, but sells it at an affordable price and reinvests the income in research and manufacturing. 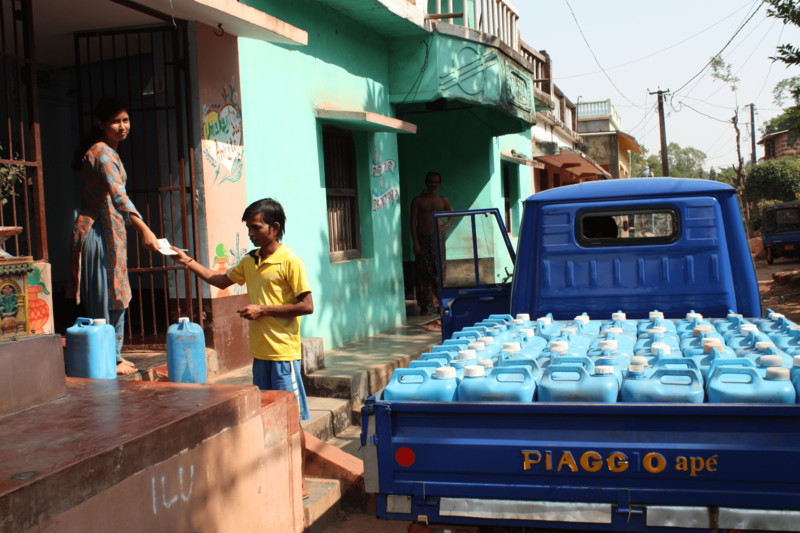 Explanation: Using a network of water kiosks, Spring Health (SH) offers daily delivery of 10 liter jerry cans of safe drinking water to the homes of people in rural communities that have traditionally been underserved by public and private water service providers. Price of the product: home delivery of clean water for $0.07 per jerrican.